FUN Show Saturday, May 21 2016 in Dallas! Home / FUN Show Saturday, May 21 2016 in Dallas! 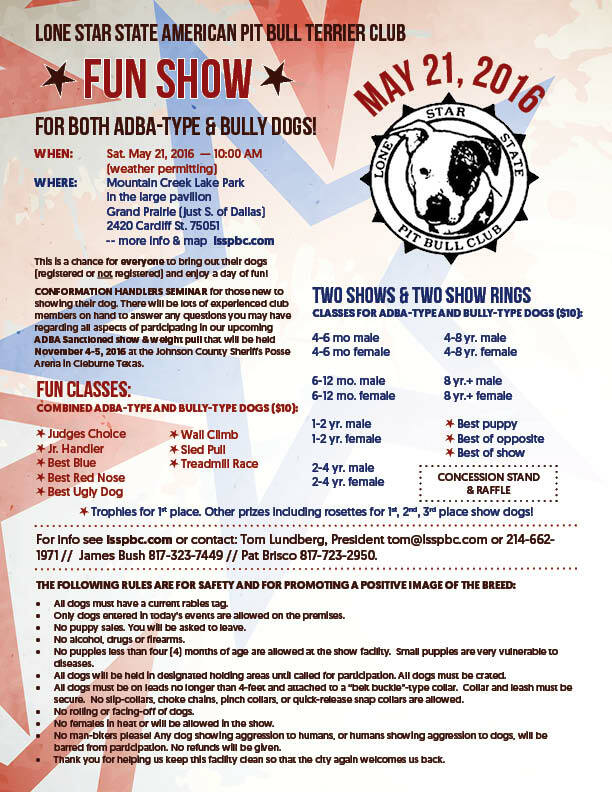 This is a chance for everyone to bring out their dogs (registered or not registered) and enjoy a day of fun! There will be a conformation handlers’ seminar for those new to showing their dog and lots of experienced club members on hand to answer any questions you may have regarding all aspects of participating in our upcoming ADBA Sanctioned show & weight pull that will be held November 4-5, 2016 at the Johnson County Sheriffs Posse Arena in Cleburne Texas.